If you are wondering the numbers in the 2nd para (in blue) … it is the no. of balls per over that England employed….. down under - Australia employed eight-ball overs in 1924-25 and from 1936-37 to 1978-79 inclusive, South Africa from 1938-39 to 1957-58, New Zealand from 1968-69 to 1978-79, and Pakistan from 1974-75 to 1977-78. West Indies, India, Sri Lanka, Zimbabwe and Bangladesh have used only six-ball overs in home Tests. ~ interestingly, there are views that Australia gave up the eight-ball over in 1979-80 and reverted to 6 balls per over due to Kerry Packer's Channel 9, which took over the televising of Test cricket in Australia in that season, pointing out that they would get more commercial breaks - and thus more revenue - with six-ball overs than with eight-ball ones. 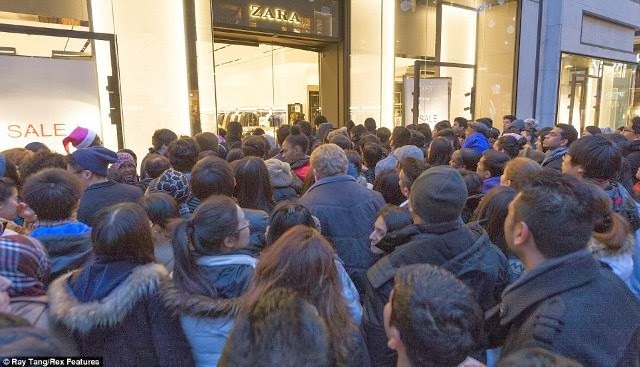 In this boxing test at Melbourne, spectators have swarmed to the ground despite Australia having already clinching the Ashes 3-0 after the third test at Perth last week……. The crowds attendance reportedly surpassed the 1961 record, set also at Melbourne, on Day 2 of the fifth test of the West Indies’ tour of Australia. 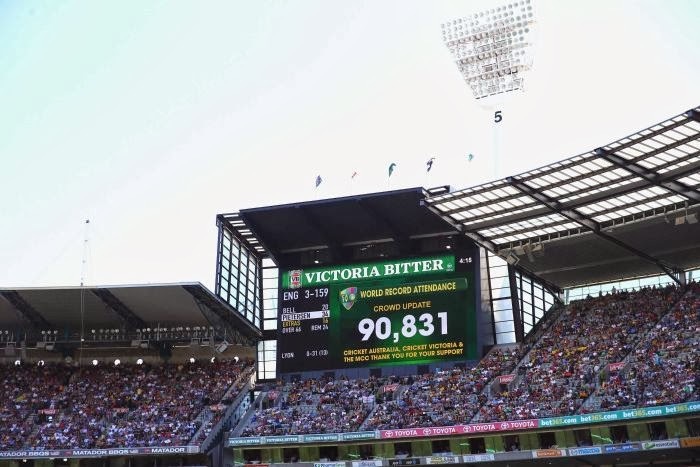 A world record crowd of 90,831 attended day one of the fourth Ashes test between Australia and England at the Melbourne Cricket Ground, according to Cricket Australia. The Thursday crowd surpassed the 90,800, also at the MCG, set on the second day of the fifth test of the West Indies’ tour of Australia in 1961. The 1961 tour was by West Indies led by Frank Worrel; Aussies were captained by the famous leggie Richie Benaud, who is well known as a commentator too. The first test of the 5 match series is remembered till date for the result – ‘ a tie ’ – which was to be repeated at Chepauk years later. It was considered to be an exciting series and the WI players were welcomed everywhere… there are reports that prior to their departure from Australia, the team were paraded through Melbourne in open-top cars and were cheered by enormous crowds. Worrell's success as captain was particularly significant, because all previous West Indies captains had been white (except for George Headley in a single home Test in 1947-8). It was the first time when the Australian Broadcasting Corporation covered all five Test matches of the series. The 5th test was played at Melbourne in Feb 1961- WI made 292 and 321; Australians made 356 and 258/8 winning the test by 2 wickets. It was a 8 balls per over era. The second day of that test was a Saturday, and a then world record crowd of 90,800 saw that match………. Many a times crowds far exceeding that no. perhaps have attended at Indian venues especially Kolkatta, but suffer because there are no exact counts officially recorded unlike in Australia. Soon would post something on the spring and the movement of millions of crustaceans in Australia ~ there were times when people bought tickets and turned out in large numbers even for seeing Ranji matches in India…………. Lahli attracted crowds for that match between Haryana and Mumbai as little master Sachin Tendulkar played his last Ranji there.
. Really, great job. It is important to me. Can i get more information from you?